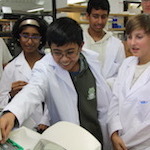 Project CRYSTAL (Colleagues Researching with Young Scientists: Teaching and Learning) brings dedicated students to the laboratory once a week to learn about the basics of chemistry and biochemistry at an age-appropriate level. When the students finish the program in May and enter high school, they will have an understanding of the central dogma of biology and of the differences between proteins, DNA, and sugars, as well as advanced concepts like cloning and X-ray crystallography. The program started in 2009 and lasted several years but then took a brief hiatus. Holden has revived the program with the help of undergraduates, who gain valuable teaching, mentoring, and science communication skills during the program. Together, Holden and the undergraduates carry on the Wisconsin Idea, using what they learn in the lab to inspire younger students to pursue a career in science. During the school year, the students begin simply learning about the atom and quickly learn how to inoculate cell cultures and run laboratory tests. The year of discovery then culminates in the students growing their own crystals and building protein models on a stereo graphics system. Each weekly meeting involves both group discussions and time in the laboratory. Project CRYSTAL alumni and their parents say the program provides great inspiration to pursue science. Success stories include a student who is now attending Rice University and another, Epiphania Malaika Maka, was accepted to four Ivy League schools and other top colleges by the time she was a senior in high school. photo on one of their first days in Project CRYSTAL. Holden hopes that other labs on campus and at different universities will take an interest in the program and says some have already been trying it. Others are taking inspiration from the program and exploring different directions, such as bringing middle school teachers into the laboratory. The program model and use of undergraduates can easily be adopted by any lab. “It’s unlikely they will remember every single thing they learned but that isn’t our goal,” explains Holden. “What they gain is confidence in their ability to learn and understand chemistry and biochemistry. They’ve also gotten to see what laboratory research can be like. When they begin to learn these concepts in the classroom at school, terms and processes they hear will feel familiar and more approachable. We started this program to help young students lead the pack in science and math, and we like to think we are doing just that."